Arrive Chennai Airport / Railway station then Departure To Pondicherry ( 170 kms. / 4 hrs.) Visit Aurobindo Ashram, Ganesh Mandir. Then proceed to Pichavaram (70 kms.) a place of rare scenic beauty with its serene back waters. Later Departure to Chidambaram (20 kms) visit Lord Nataraja Temple. Leisure in the evening Overnight stay at CHIDAMBARAM. After breakfast check-out from Hotel. Departure To Tanjore (140 kms. / 2.5 hrs.) Enroute visit to Vaitheeswaran Kovil (Vaitheeswaran Koil ) ( An ancient Temple dedicated to Shiva), Nagore (Dargah), Velankanni Roman Catholic Church ). Transfer to Hotel. Evening visit The Famous Brihadeshwara Shiva Temple (Here you can see Giant Nandi – Bull carved in a single stone, which is considered to be the Second largest Nandi in India). Overnight stay at TANJORE. After breakfast Departure to Rameswaram (250 kms. / 5 hrs.) Transfer to Hotel. Visit Ramanatha Swamy Temple. Take bath in 22 holy wells & visit Pamban Bridge. Overnight stay at RAMESWARAM. After breakfast Departure To Kanyakumari ( 350 kms. / 7 hrs.) Enroute visit Tiruchendur – Subramanya Swamy Temple. Transfer to Hotel. Leisure in the evening. Overnight stay at KANYAKUMARI. Early morning enjoy sunrise. After breakfast visit Vivekananda Rock, Gandhi Mandapam. Suchindram – Thanumalayan Temple ( which is unique as it is dedicated to Vishnu, Shiva and Brahma). Later proceed to Madurai ( 250 kms. / 6 hrs.) Transfer to Hotel. Overnight stay at MADURAI. After breakfast, proceed to Kodaikanal (115 kms. / 3.5 hrs.) a charming hill station. Transfer to Hotel. Local visit Shenbaganur Museum, Coaker’s walk, Telescope House and Kodai Lake at KODAIKANAL. After breakfast Departure To Trichy (200 kms. / 5 hrs.) Transfer to Hotel. 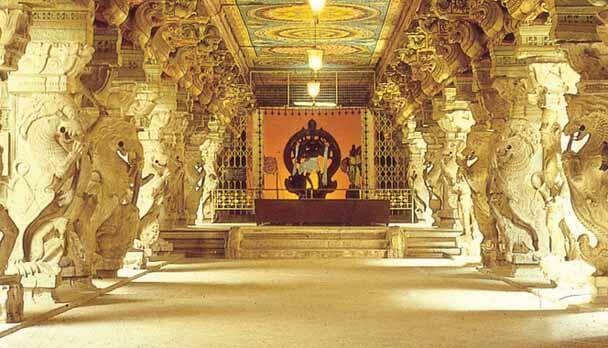 Visit Rock Fort Temple, later visit The largest Temple of Lord Vishnu at Srirangam. Leisure in the evening. Overnight stay at TRICHY. After breakfast check-out from Hotel Departure To Chennai (325 kms. / 7 hrs.) and drop at Airport / Railway station. Tour concluded.